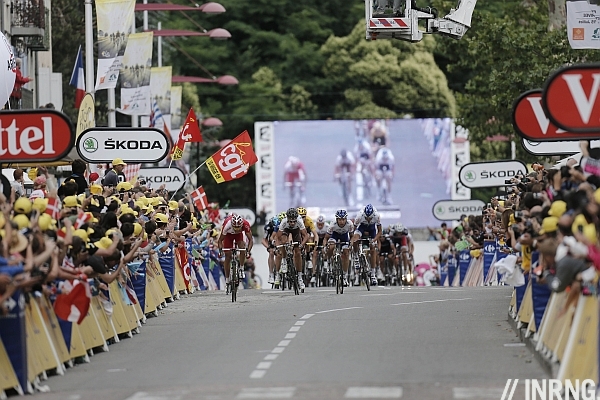 You’ve surely watched the Tour de France on TV but have you seen it for real? The Tour belongs to the crowds and readers regularly email in questions about visiting the race. With this in mind here are a few suggestions and tips to help plan ahead. The maps and full route details tend to be published on the letour.fr website in May and not before. This is a sub-FAQ with people emailing in to ask where they can find a route map because they’re not online: they don’t yet exist. It is frustrating because many want to make plans for holiday visits but can’t find the route. I’m told one explanation is that if the route is presented every October it has to get validated by all the layers of local government in France and getting every assembly, council, mayor to say oui can take time with decisions to route the race through a village or around it in play and in turn if the used road needs to be resurfaced – you can probably spot the Tour route from space in late June by all the fresh blacktop – which leads to budget discussions and so on. Whatever the reason you don’t have to wait, it’s possible to work out the route yourself, you can take a stage profile and work out the likely course between the towns mentioned, easier for mountain stages where there’s often only one route but not too difficult for other stages either. 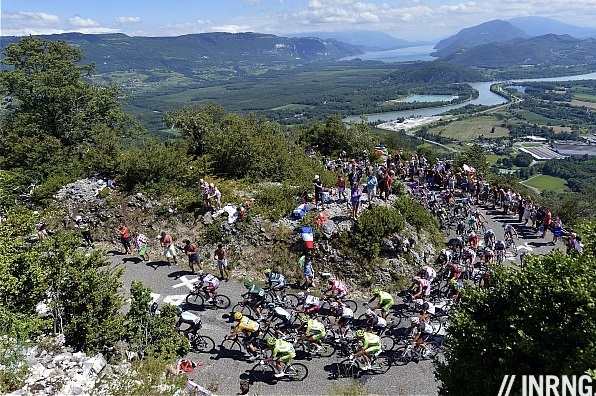 The Tour de France is so big that it tends to be more fenced off than other races and both the start and finish areas can be frustrating because of the crowds and the segregation where you need a pass to get inside. But even those with a pass, like the media, find most of the riders remain in the team bus for as long as possible rather than strolling around the village départ. On balance the stage start offers a bit more access as riders mill about and you can walk by the team buses, check out the bikes and more and things get lively with all the teams in place with an hour to go before the listed start time. The finish is worth seeing too but requires planning and persistence, if you want a roadside spot you’ll need to get there early as the crowds build with hours to go. Pick wisely and you can stand near the finish and within sight of a giant TV screen so you can watch the race. The publicity caravan will pass and the riders flash by. Beyond the finish line is a cordoned off zone but keep going a couple of hundred metres and you’ll often find team buses and vehicles – the exact configuration varies – and you can spot the riders and staff. Getting a pass: you need to have some connection to the race, to know a race sponsor or someone linked to the start or finish for your lanyard open sesame… or you can buy one from a Tour travel operator, expect to pay a few hundred euros. Outside is free and perhaps the best way to see the race is to pick a scenic spot and enjoy a picnic. Imagine being sat on the hillside pictured above, the race passing would almost be incidental to enjoying the views and local foods. So far so sybaritic but getting there needs planning. The stage route will be closed to traffic in the morning and mountain passes could be closed at dawn. You can approach by car on a sideroad, park and walk to your spot, probably following many others too but this is not possible for many mountain passes where you’ll have to park near the foot and make your way up: be prepared for a long walk. You can ride up as the police will tolerate people walking and riding into position but from about three hours to go the road becomes off limits for cyclists with the gendarmes stopping cyclists. But thing about where to stash your bike, it’s unlikely to get stolen but you may want to lock it to something so that on the off chance there’s a thief they boost someone else’s ride instead. If the weather is good set up camp with food, drink and sit back. If you’ve come equipped you’ll probably find others doing it better with folding chairs, an umbrella for shade, perhaps even a TV or even a fridge for cold drinks. If it’s bad then a local café is a good idea as it will probably have warm drinks and TV and all the locals will dash out in time for the action. Waiting: A parade of vehicles will go by including the bizarre publicity caravan and then things go quiet until the whack of helicopter rotors announces the race is coming. This is a long wait to see the riders speed past, so much that it’s culturally accepted in France, for example the 2001 film Amélie features the line that “luck is like the Tour de France, you wait ages for it only for it to pass quickly” or the apparent explanation behind the title of Beckett’s Waiting for Godot. But that’s the point of the picnic, aim for a day in the countryside rather than watching the race unfold. Which stage to watch? Take your pick from 21 stages. Many will go for the mountain stages and they offer a longer show with up to 40 minutes between the first and last rider and things you don’t see on TV such as the dropped riders and the gruppetto and the ability to actually see the riders as they go past at 15-20km/h rather than 50km/h. But easier said than done as the roads are closed early meaning access is harder. Even if you drive up the day before you’ll find most of the vantage points already occupied by camping cars and other vehicles so one suggestion is to ride up in the morning instead, after all many readers will be visiting in order to ride in the mountains as well. Just take a backpack with clothes appropriate for the day’s weather, food, drink and some shoes so you’re not click-clacking in your cleats. The riders want and deserve their rest and you may never get over the sight of your preferred rider in natty knee length compression socks but a hotel is still worth a visit if only to see the mechanics at work as they clean bikes, vehicles and get laundry done. 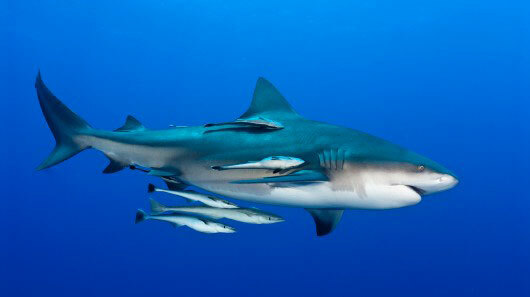 Riders typically head out for a morning spin and amateurs tag along like suckerfish but don’t get in the way. Again you can see the mechanics at work in the hotel car parks. Plan ahead. The Tour de France is a travelling circus and the riders, team staff, officials, media and more need a bed for the night. Some of the race workers sleep in special buses but otherwise the race hogs a lot of hotels and that’s before others have made their bookings to visit the race on top of all the millions of tourists who visit France every summer too. Why not visit another race? The Giro and Vuelta are good too, for example the start zone at the Giro is almost open to everyone. In general the smaller the race the easier are, you’ll get better access, be it transport or to the riders. 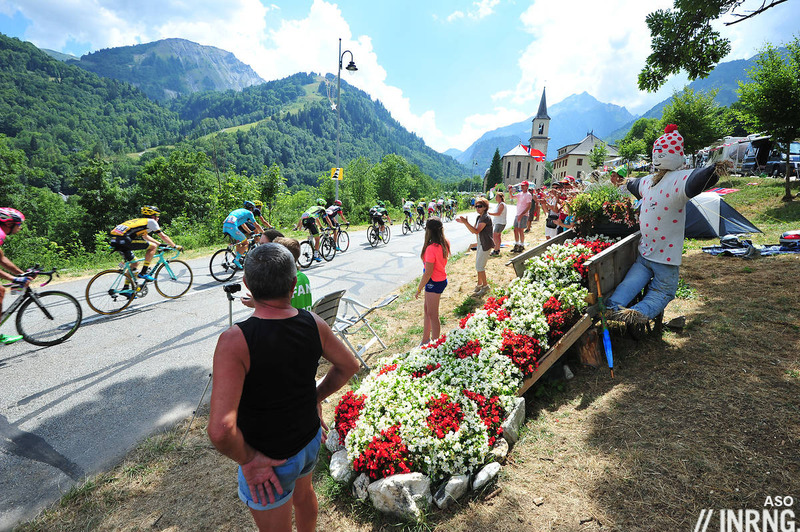 For example the Route du Sud in late June promises the peloton plus the Pyrenees minus the traffic and crowds; or the Italian national championships offers a lively circuit race around the same time of year too. Of course readers in, say, the US, Australia or Japan are unlikely to fly to Europe for niche races but if you live closer and have seen the Tour de France already then trying a smaller event can be rewarding too. We’ve gone a few times and it’s well worth doing (although you obviously see more of the stage on telly but you don’t really get the atmosphere). I was lucky enough to have corporate hospitality for the Grand Depart in London in 2007, when I had the best mass catered meal I’ve ever had, could wander round the team buses and had grandstand seats reserved (right next to the CSC seats who went mental as Spartacus finished like a motorbike to take the yellow jersey). The year before, we’d gone to Paris for the final stage which was good but it was incredibly hot and we had to set up shop very early to get to the front of the barriers about halfway down the Champs (fortunately we’d taken camping chairs with us or it would’ve been a real trial). Despite having claimed our spots a good four hours before the race appeared, it didn’t stop an American family trying to push their way in front (they didn’t make it). Problem was, while it was great for atmosphere, you couldn’t see all that much (trees, gendarmes, barriers, etc. all in the way). In 2009 we went to the Annecy time trial and took the kids and I’d thoroughly recommend that as an introduction to cycling – you could see everyone, switch off a bit if you wanted, cheer who you wanted to cheer, write on the road and wander back to the gite if you wanted to (and if the gendarmes let you). Wonderful backdrop as well. I managed to get an invite to the finish of the 2014 London stage which was a little odd in that the atmosphere wasn’t great but I got right by the finish gantry with no problem at all (too many people having wonderful mass catered meals I assume). Some very annoyed amateurs following the race weren’t allowed to go over the finish line which was a bit. So, corporate hospitality’s great if you can wangle your way in (just remember to actually watch the cycling) and if you’ve got kids, go for a time trial near where you’re staying. Still haven’t done a mountain stage, I’ll make it one day! Great tips. We had the pleasure of going 2 years ago and the point about the details in the map not coming out until May can make planning a real pain, but it was worth it. I’ll add one more tip, don’t be shy. Part of the fun is sitting around all day waiting to enjoy a shared experience with people you don’t know from other countries. Introduce yourself to that man and woman at the hotel breakfast buffet each wearing a stage pass- you just never know when you might actually end up meeting the wife and father of one of your favorite riders and they offer to give you a ride to the top of the final climb! Cheers INRNG…. have been wondering about this as there is a chance I might be finding myself in Annecy in mid July. Was wondering if anyone has any experience of just general travel while the tour is on… i.e. Do hotels generally put their prices up in anticipation? Is it likely to be harder/more expensive to get trains etc.? Also assuming start/finish towns will be a lot busier on the race day – do a lot of people stay for a few days and the town is busy for a while as a result, or are people likely to leave as soon as the circus leaves town? It’s July and so there’s a summer rate but no more than that, it’s more that you may not get the discount that they might otherwise offer in order to sell the rooms online etc. You should be fine for the trains and the towns tend to get busy for the race and then quiet as soon as it goes, in fact it’s not much busier when the race is there, just the road closures and crowds for a few hours around the finish but things disperse quickly. Would agree with this – I nearly missed the Tour coming through my hometown in 2014… made a last minute decision to pause the TV and dash out to what I thought would be a quiet less populated climb. Struggled to get a decent view – and what I consider a climb even the Groupetto barely slowed down for but still well worth making the trip. Most enjoyable race I’ve seen to date actually was a stage of the Tour of Poland which I happened to be in Warsaw for. Not a massive fan of circuit finishes when watching on TV, but seeing the bunch jockey for position over several laps before the final sprint was pretty great. My brother and a friend of him went to watch the race on Alpe d’Huez (not what I’d have suggested, but whatever). They went by car with a couple of bicycles in the boot and parked on a legitimate roadside some 30-40 kms away, then rode a route around the area before finally climbing up the famous ramps to wait for the race. Surprisingly, they were able to see something despite arriving a bit “late” (not in relation to the race – they were there hours before -, but compared to what you’d expect to need in order to find a decent spot). When they got back to the car, they discovered that it had been ransacked. As most cars in a similar situation within the range of 50 kms around Alpe d’Huez, as the Gendarmerie told them. Even getting back home became complicated. I just love train and bike for this kind of things, but I also must say that I’ve tried that mostly in Italy and in Spain. Concerning the kind of stage you could watch, inrng tips are excellent, as we’d expect. However, I’d add another possibility, too often overlooked both by spectators and race organisers: hilly, rough, tricky stages are great – close to being the best, if you’re trying (as you probably should) to enjoy the day rather than to see live *that* decisive attack on the uphill finish – which is something you’d need a good deal of luck to come across, anyway. This option is especially good in Italy where you can easily find the odd over 10% wall in the last 30 kms of race or so, where you’ll be able to watch the peloton grinding its way up in a relatively slow while aggressive fashion. Logistics is way easier because you often have got lots of ways to get there (and away from), less people tend to be interested thus allowing you a little more freedom while obtaining anyway your first line spot, the percentage of locals raises (the international factor is also entertaining, but if you’re doing this within a context of “general tourism”, so to say, well, local people are something you’d be more interested in rather than the standard international crowd). You’ll end up in beautiful places – which isn’t always true for French Alps – typically off the beaten track, where you’ll find more easily great places to eat something really good for a reasonable price, something which can be way harder in the case of high mountains, be it for lack of human settlements or for the abusive prices in ski stations. The climate also tends to be more forgiving than on the highest mountain passes. In the case of the Giro, the general keyword is “Appennini”, but the likes of Cantal, Ariège/Aude, Vosges… or Yorkshire… can serve you well in TdF’s case. Tips about ITTs I’ve read above are totally spot on. Another kind of stage we might be underrating as TV spectators but which, besides having its own technical meaning, can be just *great* for roadside fans. Watching different sections of the course, knowing which rider is coming and when, picking the hardest or most spectacular moments. The best option is obviously a technical ITT with some nasty uphill section. Again, the organisers (especially but not exclusively RCS) should think better about what they’re doing – very – recently from this POV, which is surprising given that they’ve been offering us great ITT courses for a decade or so in modern times, until the last couple of seasons. I was in London for the 2007 Prologue, and barely saw a thing – one of a million (?) people in attendance. Although, bizarrely, the next morning’s Stage 1 to Canterbury came right through our estate. It whooshed by in an instant. Not quite an Alp-side but maybe one day. Surprised they went by car, even if it was packed the train to Bourg d’Oisans is likely a better option. How far is the walk from Bourg d’Oisans to the foot of ADH mate? Well, the nearest train station is in Grenoble, so about 11 hours? ‘ll never understand why some folks think automobiles are bank vaults on wheels rather than metal and glass boxes that are very easily opened and emptied of valuable contents all the time. went to see the double ascent of Alpe d’Huez a couple of years ago. Parked by the Lac du Verney at the bottom of the Glandon, and rode across through Sardonne, arriving half way up the Alpe. I’ll never forget as we swung round into the Valley, hearing the noise from Dutch Corner rising up the mountain (well before the race too…). Just a fantastic day – and our car wasn’t touched! Well, noel, I guess it wasn’t the same year of my brother or it wasn’t the same Alpe of the dodgy gel, which happened in 2013. Unluckily, the info you provide about the Sky couple isn’t useful to know the exact year, as Porte looking good and Froome looking awful is a constant on Alpe d’Huez through their common Sky experience. I need to stress the last part of the sentence because Porte also faced the Alpe in 2011 but for sure that year he looked *way* more an ITT man than a climber – he wasn’t making the first *50* place in any serious mountain stage – and although he supposedly was on serving duties for Contador he couldn’t help much, either… curious things of cycling careers!, even in his best year he’d always struggle to make top 20s in the mountains, then in its first season at Sky you already saw him being a valuable helper, often the penultimate man before Froome and able to keep close to the final top ten on several uphill finishes, too. At least, we can acknowledge that Porte showed some notable talent since his juvenile years. 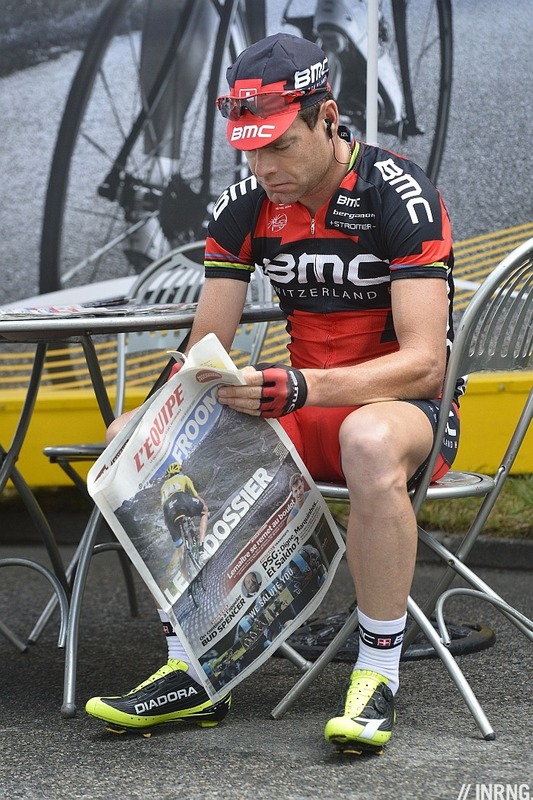 Back to the Alpe and the Tour… what you suggest looks a lot like 2013, because that’s both when the gel happened and when Porte looked fresher. In 2015 the Aussie worked hard from -5 kms to go until the last 1500m or so, then he lost contact from the yellow jersey group. Which means that in the previous 10′ on the front he was looking quite strong but perhaps not exactly fresh. Until then, all had been a Quintana/Poels affair for half an hour or so. However, that might mean that Porte looked indeed fresh while he was sitting on Poels’ wheel or when he just started his turn. That was a good Tour in terms of entertainment. The Alpe was an impressive show by Sky: whereas the likes of Quintana, Valverde, Pinot (even Nibali!) each spent a lot of time alone or on the front of their respective groups, Froome hanged there on his gregari’s wheels until the last 150 seconds of effort. At speeds over 20 km/h, that favourable condition surely made a difference, although he finally climbed as fast as a tired Valverde, 1’20” slower than Quintana and only some 30″ faster than Pinot, who had been on the attack longer than the rest. Such a situation is consistent with Froome “looking truly awful”. Quite obviously, the previous climb, which was the Croix de Fer, had been tackled at impressively high speed by the Movistar boys… if only they had done the same (on the same climb, but on the other side) the day before, when on the contrary they stopped any forcing as Valverde started to suffer! Nibali made of it a tough stage, anyway, but with Quintana along that would have been devastating. Whooops! I clearly missed the decisive point, ah ah ah… “double ascent” happened only in 2013, so that’s it – it wasn’t “a couple of years ago”, more like *five* (yeah, that sort of things with dates happens to me all the time, too). Hence I can confirm that it definitely wasn’t the year with the mass car thefts happening. geez, was that really 5 yrs ago! time for another trip I think! Some good tips from inrng. I’ve done this a few times but so far have stuck to the Giro and Vuelta as they have a more relaxed atmosphere, better accessibility (to rider/caravan etc) and hotels and transport is easier. There is always a good buzz around the finish town on the day of the race, but I think you get better value out of a mountain or medium mountain stage. Arranged a trip to the Picos Europa in 2012 and had a few lovely days walking before seeing the stage with the Contador ambush at Fuente De (which was a bonus to say the least!) You could get very close to the front of the barriers even at the finish and there was a big screen to follow the race. On these stages the team coaches tend to be parked a bit down the mountain so you also get to see riders free-wheeling back down and dodging the stragglers. Almost bumped into Cobo on the way back that year. Agree with other posts about the atmosphere at the roadside too. Stood and watched a giro stage in a snow storm in 2013 (Nibali stage win) sharing a beer with some of the locals. Due to road closures this was another chance to walk up a mountain and see some amazing scenery before taking in the race. Also well worth it to see all the caravans parked up with people enjoying a drink. I remember some drunk lads cheering and pushing every amatuer cyclist who went past and the official Oscar Gatto fan club. With a bit of planning it should be a great day out. From TdF to LBL. Going there in April and staying in Liege. With the genuine knowledge regarding our beloved sport on this blog. Does anyone has any spectator tips for that race? Liège has seen better days to put it kindly and the finish outside in Ans is rougher still but if you’re taking a bike there are some great roads to explore. If not enjoy some good local food from waffles to the local meat dishes. Mister inrng put it kindly about liège indeed… Not the most beautiful place in Belgium for sure, but well you still can have good food (waffles and meatballs in sauce are typical) and good beers (as everywhere in Belgium). Near Liège, the ardennes are good place to ride as you have a lot of quiet secondary roads and a hilly terrain packed with nice landscapes. Not really mountains but good enough to have nice rides. In terms of access, the road closures for LBL are temporary, not full-day, and the last 40-50km is easy to get to from the city if you have a car. You’re unlikely to find big crowds on the roadside, except from La Redoute and at the finish, and with a bit of planning you could probably catch the race more than once. The team buses all park up in the old town square before the start, and they were pretty relaxed about access. Most of the riders stayed inside the buses for as long as possible (it was snowing), but we were able to wander about looking at the bikes, etc., without any problems. Given the weather we watched them roll out then followed most of it on TV, before driving out from central Liège when they had about 50k to go. We were able to park within 5 minutes walk of the Roche aux Faucons climb, and got there in plenty of time to see the race come through. Very low key, no hassle at all. Thank your INRG and Richard for your tips. I Think our rented flat are close to the Old Square so it seems we’ll be where the action is. In a any case, I think the best spring classic to go to is probably flanders. There people are just crazy. There are tents with giant screens and oud kwaremont beers… Not the best place to ride tough, as it is in fact not very rural and there is quite a lot of traffic on some roads. All grand ideas and tips on how to view a “Grand Spectacle.” In my youth I relished at the idea of visiting a Grand Tour in person. The spectacle, thrill, and electricity, and anticipation of seeing the peloton pass by. All coupled with the a Grand Holiday in Italy, Spain or France no less. If you are however more interested in actually seeing and experiencing a bike race, go to smaller events. It is far easier to gain access to start/finish areas and mingle with athletes, race personnel, and others. Catch the race start and then a Sprint or climb or two and still see the race unfold at a natural attacking point or a finish. Also get to be involved in the finish area activities. At smaller races it is possible to do all this in one or two stages without the immense crowds, looting of vehicles and shortage of hotel beds and restaurant access. Enjoy visiting Le Grand Boucle or whatever cycling event you choose to patronise. Please carry out your trash and a little extra when you do. Down the the Champs E to watch Froome get his fifth? Tempting. Great article, if I go to a mountain stage, where can I take a pee? Roll up your shorts, get a domestique to hold you steady and go on the side of the road like the riders do? I was on the Kwaremont last year too… T-shirt, casquette and a few tinnies. I did the sportive the day before and that was cold, muddy and wet. I was there last year too. We took the train from Ypres and caught the bus from the train station to the Kwaremont. The fan areas are all free, but you can still bring in food and drink. A great atmosphere indeed. The riders absolutely fly up the cobbles. It has to be seen! It’s so well ogranised. Considering it’s free, it’s really quite something! With the weather and racing drama last year, I can’t imagine a much better day out then we got. I’ve been for the last three years to the RVV, great weather every year, so expecting the worse this time.We try for a couple of cobbled sections like the Haghoek and then go to the Paterberg for both ascents. One of the best days of the year. Going to the tour for he first time, for Alpe d’huez, the atmosphere’s half as good it will be a good day. Another thing to consider is the one day races where there is also a women’s race on the same day. In 2017 my wife, 18 month son and I happened to be in Europe from Australia and went to both RVV and LBL. For both we enjoyed seeing the women and men race by. For RVV we started in Antwerp to watch the men’s teams introduction and the depart – this was a great experience with the big crowds but still great access to see the riders. I remember standing just behind the barrier next to a DiData rider who had lost a screw from his cleats and was frantically trying to sort it out as the peloton departed… We then caught the train to Oudenaarde where it was straightfoward to get right on the barriers about 300 metres from the finish (and see the big screen to keep track of things). The women’s was a fast finish with a sprint. But I will never forget watching Gilbert ride slowly by enjoying his victory in the men’s. For LBL we went to a caught the train from Brussels to a small town called Méry at the base of Côte de la Roche-aux-Faucons. There is a great little restaurant in the town. We arrived early had a drink and a bite to eat. Walked about 1km up the hill, watched the women, walked back down and had another drink, walked back up and watched the men. After that had a nice dinner before catching the train back to Brussels. The hill is later in the race and the is steep so peloton is quite spread out (and the stragglers taking it easy) making it easy to see all your favourites. I would definitely love to do TDF though! That sounds like a fantastic day. I think you sold me. If possible, no part of you – including selfie sticks – should be on the road. You’re not part of the race – don’t touch the riders. If you’re really interested in the race, why aren’t you watching it instead of mugging for the camera? +1 I still blame this stupidity on that stinky guy in the devil costume. When he first started his antics (and let’s not forget he has/had advertising attached to the giant bicycle sculpture he towed behind his car) I was outraged that our tour clients seemed more interested in having their photo taken with this guy than they were in the actual race! His own antics rarely get in the way, but as usual, if something is seen as good, more it must be better and now legions of morons interfere in races the world over in attempts to get their mugs on TV. I don’t consider them race fans – they’re exhibitionists taking advantage of the sporting world’s interest in these events. I take perverted joy when the police or other spectators yank these clowns off the road or trip them up, though overall I wish the TV directors would cut away any time these bozos catch the TV camera operator’s attention. Women race are a great option to have full access. I enjoyed a lot every single Girodonne stage I could watch by the roadside (especially the Stelvio, but the Brianza climbs were also good). Of course, you don’t get the emotional boost of big crowds, the roaring crescendo of motos and helicopters and that sort of things which are a significant part of the experience in a big race… but that’s also true for many smaller men’s race. In that sense, I used to watch by the roadside the Settimana Lombarda which was a great occasion to get close to many big names of the peloton; it often had a good uphill ITT to enjoy running beside the big or less-known figures you wanted to spirit up (sorry J Evans ^__^ however, in cycling you *are* part of the race, in a way, just like stadium sports fans, or more) without any risk, since there was nearly nobody around and you could keep the adequate distance to the rider. But you surely noticed the different emotional impact when compared to the Giro. The Lombardia was maybe an ideal middle ground, big crowds, great media show on and, all the same, you often can ride around with the riders once the race is over (even better: typically, you can ride back home for tens of kms with those who DNF). Never actually watched the TdF in France but got to watch it when it visited Yorkshire for the Grand Depart in 2014, stage 1 I watched the start with my family who don’t really like cycling as a sport but certainly got caught up in the excitement of seeing the race in person. Watching stage 2 has to be one of my favourite days on the bike ever remember arriving in Haworth Main street which is a short cobbled road, it was already packed with people hours before riders were due to be there, cheering us on and shouting encouragement as we rode up the road as if we were the pros – great memory!! We picked a spot where we could see the riders approaching the hill (no mountains in Yorkshire!) so as soon as we heard the helicopter we knew they were close and eventually could see them approaching our spot and certainly built the atmosphere among the crowd. Part of the legacy of the Grand Depart in Yorkshire was Tour De Yorkshire and obviously significantly lower key than TdF, I’ve gone to pretty much every stage since its inception. As it’s lower key it is nice to mill around the start and finish areas with lots of riders happy to stand and chat. I normally always ride to the spot I’ve picked which is generally a steep hill to see them at a slower speed, always amazing to have had a go at the climb before they arrive with other roadside spectators cheering you on, struggling like a dog then watch the pros as they glide up a lot faster than your own effort!! When I go to watch a finish, it is generally with my family as they normally have various activities on the go with big screens to watch the action. I have been every year since 2008 and always enjoyed the time immensely i was privileged to see Froome run up the Ventoux probably the most bizarre thing. This year i am off to see the cobbled stage and will have the thrill of riding out and back! A trip to Belgium for the classics is fab also perhaps ride the sportive? We have done 3 trips to see the Tour and learn new tips every time- usually through making schoolboy errors. One thing I would recommend is checking the road closure times. These are given when the final route map is made available. While really useful we have found that they can be more of a guideline rather than gospel. This is particularly important if your after stage escape route requires you to be on the other side of a mountain pass before the road closes, so always add a bit of extra time to get there. Other than that- just get out there and make things up as you go- its makes it way more fun! I’m a big fan of the cobbled races and have visited every year since 2008. I was searching for some info on race radio frequencies for the full experience with a radio scanner, which I also found are now much cheaper than they used to be. Have you ever listened in? and do you know of a reliable source of frequency information for Radio Tour etc. I saw they published it in 2015 on letour.fr. It’s usually always the same frequency so if you have the 2015 frequency it’ll be the same. There are many channels though for the police, commissaires, medical staff and the team cars. I was in Ans last year (LBL). Maybe its not the best race to go to watch. In Huy they have the woman race and you see the pros 3 times. In LBL just one transit, no programm. Helicopter sounds flying very close above the ground, Dan Martin dancing uphill-making a great impression. Valverde stoically like a motorbike-effortless looking- behind him. A little sprint and nearly the rest came in very slow- looking pumped and tired like hobbyriders on the finish line of the Ötztaler. I agree it’s a made for TV event but watching it on SBS in the late hours during a cold southern winter traverse that beautiful French scenery always makes me want to jump on a plane and head for the roadside. Followed the race many years back with a tour group and was exhausted just doing that, heaven knows how the riders manage the enormous stress of riding it. For me the best way is to be based for a few days or a week where a stage will pass through, ride during the morning, come back have a shower then lunch and watch it in the comfort of a bar or in a comfy chair. Great tips Inrng, this is already on my list of future trips, but I’ll definitely bring your guide when I do. – Many French villages are on a slope, so depending on which way they go through, they may be going through at 25-30kph or 70-80. In Normandy grand depart, from what I could tell, most of the villages/towns were on 4-5% gradients. Useful to see the route when deciding which town to try and get to. Watched the Tour on the upper slopes of the Galibier this year. As it turned out, followed most of Inrng’s suggestions and it was perfect. We drove up to the Col du Lauteret and rode up the back side of the Galibier (which the race descended down) and over the top. Packed food, jacket and sneakers. It was great. Word of caution – they shut the road over the summit at its upper reaches (and the tunnel beneath the summit) to cars and cyclists hours before the race comes through. Get there early. Just my thoughts….went to the Tour in 2013 (Alpe d’Huez double) and the best trick we learned (I went through an official tour operator but on a self-drive version) was to drive to Oz and take the telepherique or cable cars all the way up. It was great, we meandered down through the village and got a roadside spot. Car was fine. I’ve seen the ski lifts working for other mountain top finishes. I also met a nice Dutch guy at the stage start in a village in Provence and he goes every year, rents a place in wine country and gets to usually 3 of the stages. Thanks to that 2013 trip I now have a great idea of villages to stay in, so long as the race goes close by, without needing the exact race route. Another option is to go see the Spring classics. Whatever one may think of the route change’s effect on the racing, the Tour of Flanders is very well set up for spectators, even with the massive crowds. And races like E3 Harelbeke are even easier; same cobbled climbs (for the most part), much lighter crowds. A little more than a week could see you at Flanders and Paris-Roubaix, and you can while away the week in between riding sections of the routes of the races, or perhaps participating in the races’ sportives. If you are in Paris I would recommend standing on the Rue De Rivoli, opposite or next to the Jardin des Tuileries. Although it’s still pretty rammed I managed to get a decent view, despite arriving reasonably late. Obviously you get several chances to see the peloton as they do the loops up and down the Champs Eleysees. There’s also some shade if you stand on the Jardin side. I have also watched by the roadside in Belgium, and though on a bit of a climb they shot past very fast. We had been there several hours waiting to beat the road closures. This wasn’t a problem for the cycling fans amongst us, but the partners and kids found it less thrilling! If you really want to get up close I would suggest some of the other one day races. Amstel Gold is excellent as the start area in Maastricht town square is very accessible, and the route brings the riders by some places several times. One step down again you get much more of a feel for the race at smaller events such as the Volta Limburg Classic. Here the riders are often happy to chat before the depart. Even races like this have big screen TVs by the finish zones, which are free, and there are lots of little cafes to sit in and watch if the weather is unpleasant. If you have a bike the looping nature of many of these races allows you to ride point to point, cutting corners and catching the race multiple times. You get an experience much more visceral than one seen on TV. Hey @INRNG , any ‘special’ tips on Flanders/Roubaix? See http://inrng.com/2013/03/one-day-race-spectator-tips/ from before, this covers more about visiting one day races. The one part of the route that’s always a certainty is the finishing laps around the Champs Elysees. 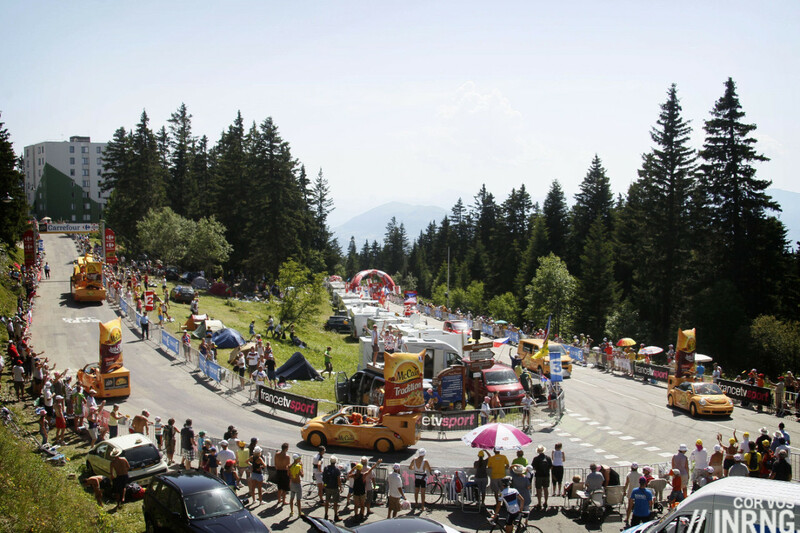 We saw the finish of the 2008 tour, as well as stages of the Giro (Aprica) and a Vuelta (Segovia) the same year. Logistically Paris is by far the simplest option at the TDF, as it’s easy to access from a number of metro stations or anywhere in Paris really if you take a Velib (but beware, all the Velib parking stations nearby fill up hours before the race arrives, so you’ll need to park some distance away and walk). Even if you haven’t been able to travel with your own bike, you’ll be able to ride a lap or two of the Champs Elysess on your Velib after the road has been closed (which was way more fun than it was mixing with the traffic the day before!). In a city the size of Paris, even Le Tour is only a blip in the accommodation bookings so there will always be somewhere to stay. One last hint, don’t expect to get any advice from tourist offices in Paris on getting to the tour outside of Ile de France – they won’t be remotely interested in helping you travel to another region. Easy to get that sort of info now I suppose in this day of ubiquitous smart phones, but back in 2008 it was a real pain trying to work out how to get to and from the TT the day before the tour arrived in Paris.